We are writing this open public letter to you because a solution has still not been found to what you have described, in a letter to City Council leader Gordon Matheson, as our “legitimate concerns” over the closure of The Accord day centre in Dalmarnock for people with severe learning disabilities. In the letter, you said you were “very concerned” about the closure of the centre, stressing that “no group should feel dispossessed” as a result of the Commonwealth Games. Previously, when you visited the users and carers at the Accord centre in May 2011, you emphasised the fact that the Scottish Government – “all of us […] every taxpayer in Scotland” – is paying 80% of the costs of the Games and you therefore have a “locus” on the issue. You also said that people in Scotland should have a “good feeling” about the Games. We assure you that we do not have a ‘good feeling’ about the Games at present. In the same meeting you said that if it could be established that a ‘like-for-like’ facility was promised on the basis that the Accord centre was being removed because of the Games, then you had “locus” to see that promise fulfilled. 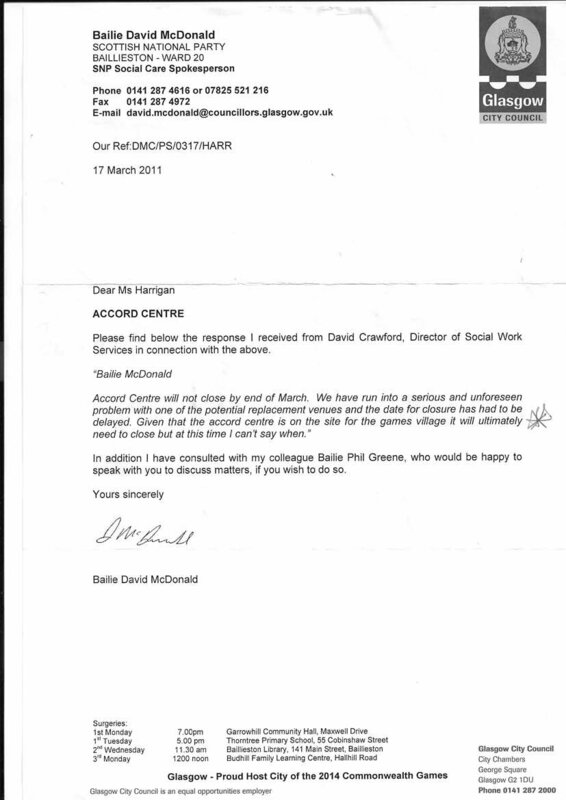 The evidence that the Accord centre was closed because of the Games is indisputable as made clear in letters by Labour Party Councillor Euan Macleod (08.03.2011) and SNP Social care spokesperson Bailie David McDonald (17.03.2011). The use of the term ‘like-for-like’ is your own. In fact what was offered was a “new centre”. This is evidenced by meeting minutes from an East Glasgow Community Health Care Partnership meeting (ECHCP) on 30th May, 2008. At the meeting, Labour Councillor Jim Coleman, and Mark Feinmann, then East Glasgow CHCP Director, acknowledged the need for either a “new centre” or “new build centre” several times, with Mr. Coleman making a “guarantee” that if the carers need a new centre then service will continue. Since then, of course, there has been much vacillation and denial, but as you yourself have pointed out, indications, if not absolute cast-iron commitments, were made which users and carers at the Accord centre had reason to take in good faith. The care of those with severe learning disabilities is at stake after all. The carers were even involved in helping to design and plan the new build centre – as suggested by Mark Feinmann at the meeting on 30th May 2008. In a letter to Labour Councillor George Redmond, David Crawford, former Executive Director of Social Care Services, accepted that Councillor Coleman and Mark Feinmann had given a “strong message” to the East End carers group “that a legacy development was possible”. He further stated that Raymond Bell, Head of Mental Health, had confirmed Councillor Coleman and Mark Feinmann’s “commitment” to the carers was “genuine”. As your letter to Council leader Matheson states, the carers and users of the Accord Centre have every reason to feel “legitimately aggrieved” that legacy commitments have not been fulfilled. You also said, correctly, that the ‘ideal’ of showcasing this city to the world “cannot be sustained” with such a tawdry outcome for some of the most vulnerable people in Glasgow on the site of the Games. In a letter to the East carers group (here and here) you said you were “committed” to “ensuring” that the legacy of the Commonwealth Games includes recognition of the needs of people with a learning disability. You proposed that the new Tollcross Aquatic Centre could be adapted for use after the Games to “ensure” that a modern facility similar to the excellent Harry Smith Complex in South Lanarkshire be made available for people with learning disabilities. That assurance filled users and carers of the Accord Day Centre with great hope. You also recently re-affirmed a funding commitment to East Carers of £150,000 as part of the 2014 Games legacy for a “modern, fit for purpose facility” within the Tollcross International Swimming Centre after the Games have finished. Yet these commitments remains unfulfilled. Meanwhile, the unsuitable and inappropriate Bambury Centre, as you yourself stated in your letter to Council Leader Gordon Matheson, provides an impoverished solution to the specialised needs of people with a learning disability. When you visited the Accord Centre you had just been elected First Minister of Scotland. It was perhaps easy to make commitments in that moment, but reality bites for people with disabilities in the East of Glasgow. We have become accustomed to being used as a ‘political football’ between the SNP and the Glasgow Labour Party. We ask you now to follow through on your previous commitment, to use your self-declared “locus” to ensure that the Commonwealth Games 2014 does in fact contain a ‘legacy’ for people with a learning disability in Glasgow. A further open letter has been sent to City Leader Gordon Matheson. We ask you both to resolve this issue immediately. We assure you that the ‘legacy’ ideal of the Games will forever be tainted if the commitments made by both the City Council and Scottish Government are not ensured. ← Alex Salmond at the Accord Centre – A Commitment Unfulfilled?